Quiche hadn't been on the menu for a while, so one day when I needed to figure out what I could make for dinner that wouldn't require a trip to the market, this was it. You can make a quiche out of anything, so I took an inventory of the larder. I always have flour, butter and a few kinds of cheese; but what else did I have on hand? I had exactly 6 ounces of bacon, a little piece of onion, eggs and milk. 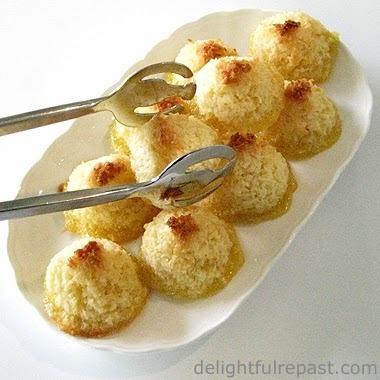 Simple ingredients, wonderful flavors; resist the urge to embellish. About "blind" baking or par-baking a pie shell: You can use pie weights if you want to, but I never do. And I never have trouble with the pastry sliding down into the dish. I think that is because I rest/chill the pastry before rolling it out. Then I roll it out and settle it into the pie plate without stretching it, do a nice crimped edge, and pop it back into the fridge for another rest/chill before baking. And it never bubbles up on the bottom or slithers down the sides; it comes out just the way it went in! 3 Turn dough out onto a piece of plastic wrap and flatten slightly into a 4-inch disk; double wrap; refrigerate for one hour or up to four days. May be frozen for up to a month; defrost, wrapped, in the refrigerator. 4 If dough is thoroughly chilled, let it stand at room temperature for 15 minutes before rolling. Butter a 9-inch glass pie plate. On lightly floured surface, roll out disk to a 13-inch circle about 1/8 inch thick. 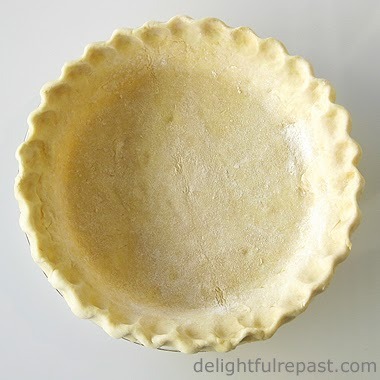 Place pastry in pie plate, being careful to not stretch the dough. Crimp the edge. (Sometimes you need to chill the pastry a bit before crimping.) 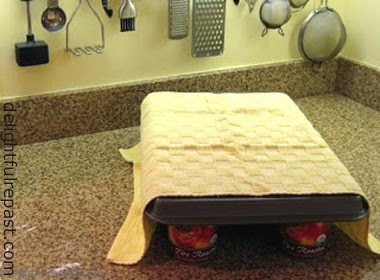 Cover loosely and refrigerate* for 30 minutes. During last 15 minutes, preheat oven to 375 degrees. Prick the bottom of the crust all over with a fork. Bake the thoroughly chilled crust for 20 minutes. 5 *While pie shell is chilling and then baking, prepare filling. In skillet, sauté the bacon pieces until slightly crisp; drain on paper towel. Pour most of fat out of the skillet and sauté the onions for 5 minutes. 6 Remove par-baked pie shell from the oven; leave the oven at 375 degrees. In small bowl (I use a 1-quart glass measure), combine eggs, milk, salt, pepper and herbs. Scatter a third of the cheese over the crust, then the onion, half the remaining cheese, the bacon, half the remaining cheese. Pour in the filling, and sprinkle with remaining cheese. Bake at 375 degrees for about 35 minutes or until crust is golden and knife inserted in center comes out clean. Note: Vegetarians might like my Vegetable Quiche (Julia Child fans might enjoy the post because it includes one of my Julia stories). 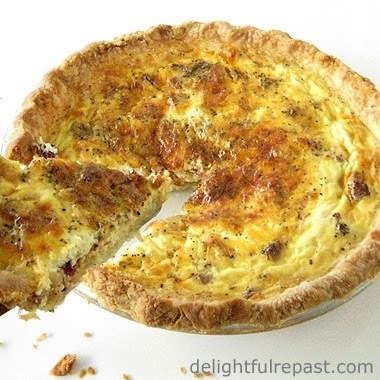 And there are lots of quiche recipes in Julia's Mastering the Art of French Cooking (2 Volume Set). Gingerbread is one of those things that always tastes even better the next day, so it's a great thing to make when you really need to get some of the cooking done the day before. Spicy and sweet, gingerbread is often too sweet for my taste. If you're looking for a sticky and cloyingly sweet gingerbread, this isn't it. 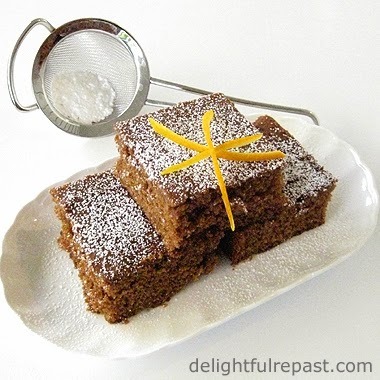 A lemon sauce is classic with gingerbread, but I think it is too assertive for the spicy cake. I prefer a lovely Custard Sauce or a dollop of not-too-sweet whipped cream or even a mere dusting of powdered sugar. A cake worthy of the most accomplished bakers, it's also perfect for novices. Requiring no real technique or special equipment, just a big spoon and bowl, it's virtually foolproof. Gingerbread cookies, tasty as they are, are something I never make. I prefer my chewy Molasses Ginger Cookies. About the only rolled cookies I ever make are vanilla-scented all-butter rolled sugar cookies, which I have not yet posted. Note to self: Get on it! What are you baking? * Or put 2 teaspoons vinegar or lemon juice in 1-cup measure and add milk to make 1 cup; stir and let stand for 5 minutes. 1 Prepare an 11x11-inch square or 13x9x2-inch pan. If you'll be serving gingerbread directly from the pan, just grease it or spray with cooking spray. If you'll be turning it out of the pan, grease and flour it. Preheat oven to 350 degrees. 2 In large mixing bowl (you won't need a stand mixer or even a hand mixer for this), whisk together flour, sugar, baking soda, salt and spices. 3 In 2-cup glass measure, melt the butter; add the molasses and hot water to the cup (don't bother to stir). 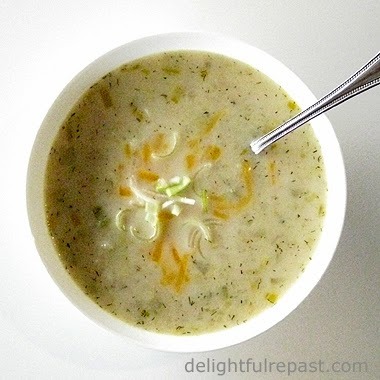 Pour into the dry ingredients, and with large spoon mix just enough to moisten. Sprinkle orange zest over the batter. 4 In same 2-cup glass measure (no need to wash), whisk together the eggs and buttermilk. Stir into the batter in fourths, mixing well after each addition, then beat rather vigorously by hand for 1 minute. 5 Pour the batter into the prepared pan. 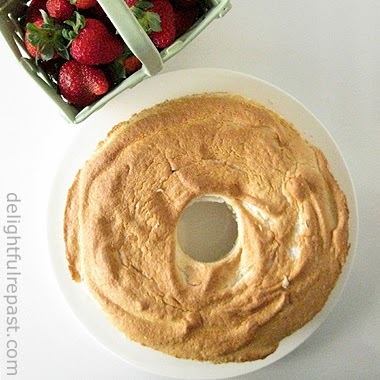 Run a knife through the batter a few times to break up any large air bubbles. Bake at 350 degrees for about 30 minutes, or until it is pulling away from the sides of the pan and tests done with a toothpick. 6 If serving from the pan, let cool in pan on wire rack for 15 minutes before cutting. If turning out, cool in pan on wire rack for 5 to 10 minutes, then turn out and continue cooling on wire rack. Will keep at room temperature, wrapped tightly in plastic wrap or foil, for up to 4 days. Can be frozen, double-wrapped, for a month. Thaw, wrapped, at room temperature. It is fabulous! 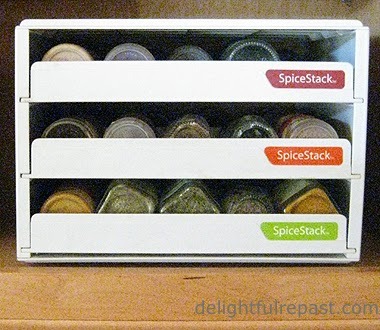 The SpiceStack Flip-Down Cabinet Organizer holds 27 to 54 herb and spice bottles, depending on whether they are the tall or short ones (comes in other sizes as well). And it is so inexpensive, you can buy two if you like! I have it sitting on the bottom shelf of the wall cabinet of what I call my baking center. Indian pudding may not win any beauty contests; but, like your mama said, looks aren't everything. 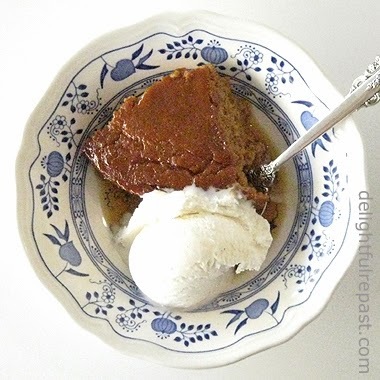 Indian pudding, so named because the settlers called the corn meal introduced to them by the native people "Indian meal," is one of the first American foods to be documented. The earliest versions likely had nothing more than cornmeal, milk and molasses. Though refinements have been made over the past four centuries, they've been pretty minor. I like to make it in honor of my ancestors who came over from England on the Mayflower. Every time I make it, I wonder why I don't make it more often. It's so easy and so good (if not pretty). 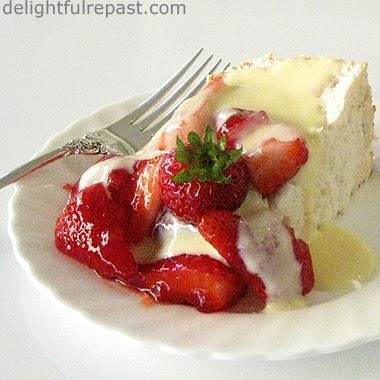 In fact, if you need another dessert today, this should be it! You probably have all the simple ingredients on hand. Just whisk it on the stovetop for a few minutes (or get one of the kids to do it), pour it into a casserole dish, pop it into the oven and forget about it for 2 hours while it bakes and fills your house with its homey aromas. 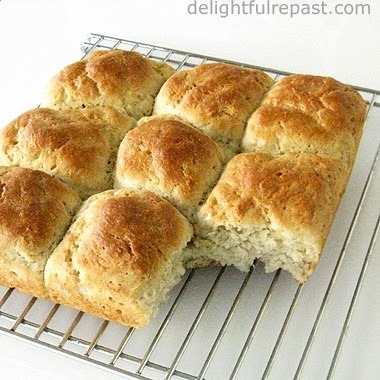 Gluten-Free Pull-Apart Dinner Rolls that are as wonderfully fluffy as gluten-free gets! A festive meal must have dinner rolls! With so many people on gluten-free diets these days, I thought I better post these rolls today. If you're not gluten-free, here's my regular Pull-Apart Dinner Rolls recipe. If dinner's not for a couple more hours, you've still got time to make these. They are so easy and come together quickly. If you haven't already stirred up a batch of my favorite gluten-free blend, do so just as soon as you get the ingredients. 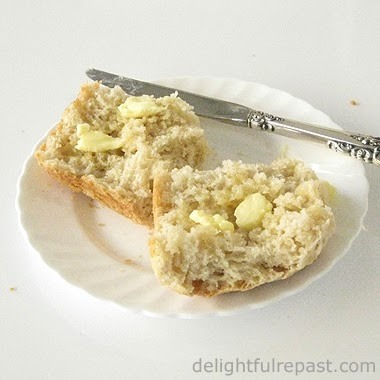 Adjustments would likely have to be made to this dinner roll recipe to work with another blend. 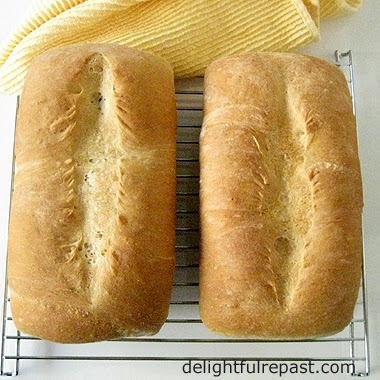 Jean's Favorite Gluten-Free Blend: I use Bob's Red Mill gluten-free flours and starches. If you use a different brand, the package sizes might be different, in which case you would need to use a scale to duplicate this formula. In large bowl, whisk together until thoroughly combined: a 24-ounce package potato starch, a 22-ounce package sorghum flour and a 20-ounce package tapioca flour. 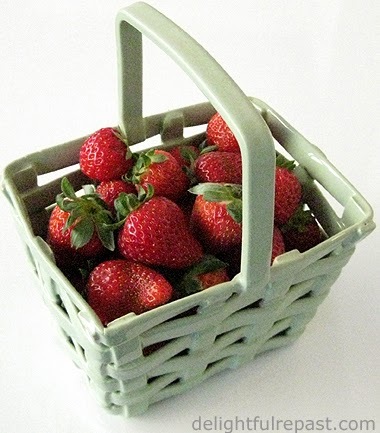 Pour into air-tight container and store in refrigerator or freezer, depending upon how often you use it. If you don't have a scale, I would encourage you to get one. 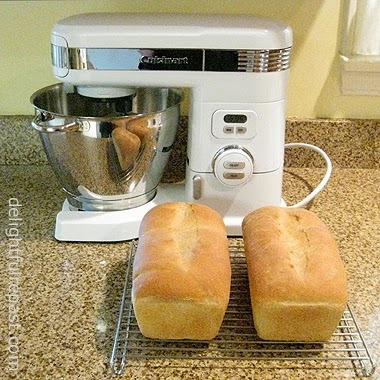 It doesn't cost that much and it will really improve your baking. Since I got the OXO Good Grips 11-Pound Digital Scale, I think I've used it every single day for one thing or another. Why weigh? Everybody measures flour differently. Some spoon the flour into the measuring cup and level it off. 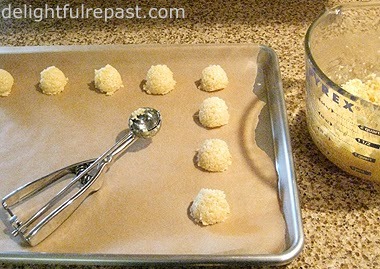 Some dip the measuring cup into the flour and level it off. Try it and you'll see that the weight will be different every time. I've found the most consistent measure to be what I call a packed cup. It's sort of a dip-and-sweep with the added step of pushing the flour down a bit to eliminate any big air pockets. It's pretty much 5 ounces every time for a cup of unbleached all-purpose flour. 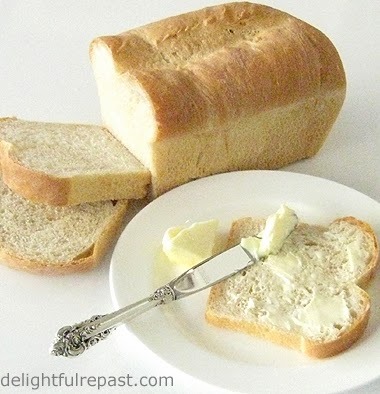 But that isn't necessarily true of all the various gluten-free flours and starches. Since the weights of a given volume can vary substantially, weighing is the most accurate way of measuring flour. Do you need a stand mixer? 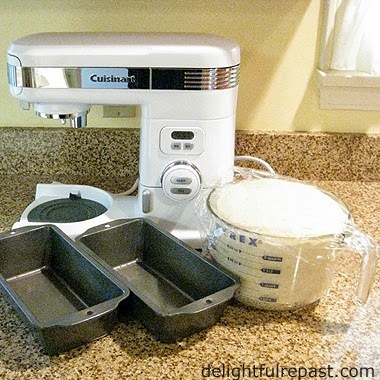 Yes, you really do need a stand mixer to make gluten-free yeast doughs. Since the doughs have no gluten and are not kneaded, they need to be beaten vigorously to develop structure. I don't think it can be done adequately by hand or with a hand mixer, at least not by me! 1 Start the dough about 2 hours before serving time. 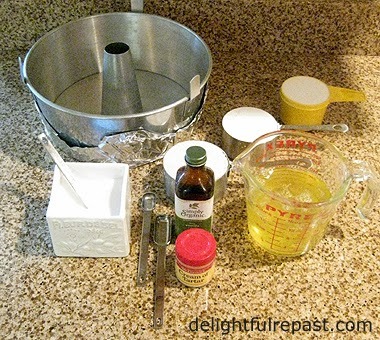 Put a square of parchment paper in an 8x8x2-inch square glass baking dish; grease parchment and sides of dish with 1/2 tablespoon of the softened butter. 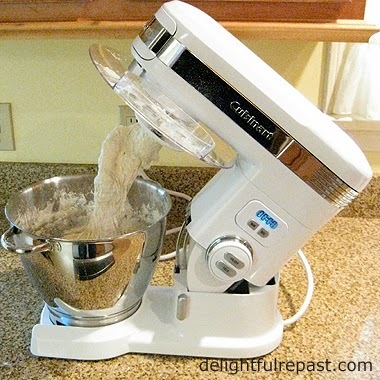 In bowl of stand mixer with flat beater attached, mix together dry ingredients for about 30 seconds. 2 Put water and 3 tablespoons butter in 2-cup glass measure. Microwave on high power until water is warm (105 to 115 degrees), about 2 minutes, depending on your microwave oven. Stir until all the butter is melted. If the liquid is too hot it will kill the yeast, so I always check it with my Thermapen instant-read thermometer. 3 Add it, along with the egg and vinegar, to the dry ingredients and mix on low speed until combined. Scrape down sides of bowl. Mix on medium to medium-high speed for 3 1/2 minutes to develop structure in the dough. It will be a sticky dough, somewhere between a regular bread dough and a batter. 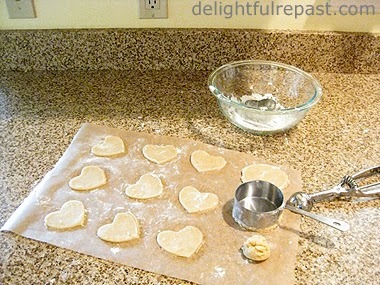 4 Using an oiled or cooking sprayed size 12 disher/scoop or 1/3 cup measure, place 9 scoops of dough in the prepared pan. 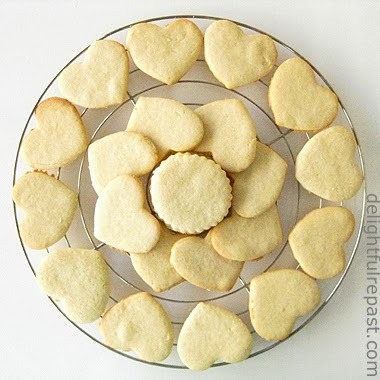 Melt 1/2 tablespoon of butter and brush the tops with it, smoothing the tops as you go. Cover loosely with a square of oiled parchment paper and let rise until doubled (I don't bother to cover the pan when I can just set it in the microwave), about 1 1/4 hours, depending on the temperature of the room. During the last 15 minutes, preheat oven to 375 degrees. Note: While perhaps not exactly "doubled" when you're talking about gluten-free dough, the rolls will have expanded to the point of filling the pan and being nearly as high as the top of the pan and looking very puffy. 5 Bake at 375 degrees for about 25 minutes, or until well browned. Remove from oven and, keeping rolls together, turn them out of the pan and cool on wire rack a few minutes before serving. Serve promptly--gluten-free rolls never really reheat very well; but if you have leftovers you'd like to reheat the next day, wrap them in foil and heat at 350 degrees in a preheated oven. Disclosure: Some links in this post are affiliate links. If you purchase something from Amazon through one of my links, I receive a small commission, at no additional cost to you, which I use toward the expenses of running this blog. See full disclosure on my Shop page. 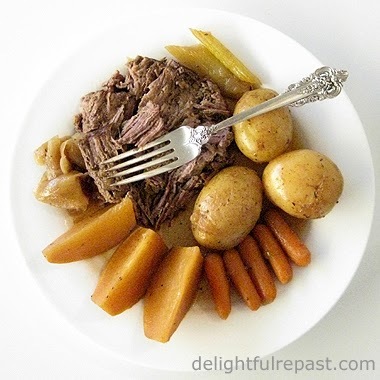 Why am I blogging about pot roast when everyone else is talking turkey? Because my dad would not eat turkey more than once a year and other poultry, never; it had to be beef or pork for him every day. So I'm here with an alternative, you might say. Besides, it's autumn, when we crave the comfort of hearty dishes like this comfort food classic. 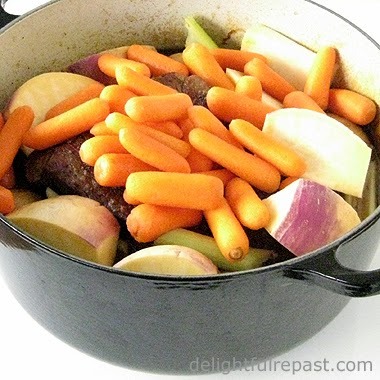 When you make this satisfying one-pot meal for people, they are transported back to their childhoods when mothers and grandmothers cooked things many people now feel they haven't the time to cook themselves. Although this recipe takes time, most of it is unattended. There are no tricky techniques, but you'll find that careful browning brings out the fullest flavor of these subtly seasoned simple ingredients. By cutting our meat consumption in half. Most Americans eat more meat than is good for them, so I figure eating the good stuff in smaller portions or less frequently is better for us anyway! I don't buy many "empty calorie" snacks and convenience foods, so more of the grocery budget can go toward whole ingredients. I try very hard not to waste food and have gradually gotten to where I actually waste very little now. After all, the higher prices for organic and grass-fed and all that has been a powerful motivator! All Rocky Mountain Organic Meats are 100% grass-fed, grass-finished and certified organic. No hormones, antibiotics, grain, GMO feed or irradiation. RMOM is dedicated to environmentally friendly agriculture practices and, most important to me, the ethical treatment of animals. There are no feedlots where deadly antibiotic-resistant bacteria thrive. The animals roam free and are treated humanely. Details of the organic grass-fed beef chuck roast giveaway follow the recipe. * Rutabagas are called swedes in England and neeps, I'm told, in Scotland. 1 Heat 5.5-quart (or larger) Dutch oven; heat oil. Pat beef dry and coat beef with 3/4 teaspoon salt, 1/2 teaspoon coarsely ground black pepper and 1/2 teaspoon sugar. Brown well on all sides in hot oil, taking about 15 to 25 minutes; transfer to plate. Preheat oven to 300 degrees. Add the onions to the pan and cook until browned, about 15 minutes. Add broth, Worcestershire sauce, bay leaf, and marjoram; bring to a boil. Put the meat back in the pan. 2 Cover pan with foil and lid, and simmer in preheated oven for 2 hours. 3 Stir in 1/4 teaspoon each salt and pepper, and add vegetables. Cover and return to oven for 2 hours. Discard bay leaf. Remove meat and vegetables to serving platter; cover. Thicken the sauce with a little slurry of water and flour or by just reducing it (boiling it down) to your preferred thickness. One winner will receive a 3- to 4-pound organic grass-fed beef chuck roast from Rocky Mountain Organic Meats. All continental US residents who leave a comment (one entry per person) on this post before 11:59 pm Eastern time Wednesday November 20 will be put into a random drawing. Winner will be announced here in the comments before noon Eastern time on Thursday November 21. Note: Please include your email address in the body of your comment. If I don't hear back from the winner of the random drawing by noon Eastern time Sunday November 23, another drawing will be held and a new winner selected from the original entrants (those who commented before the giveaway deadline). 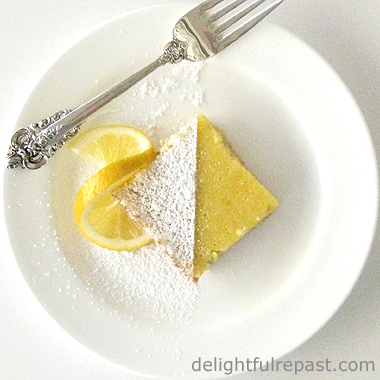 Follow Delightful Repast on Twitter and Delightful Repast on Pinterest. Disclosure: The product for this post and giveaway was provided by Rocky Mountain Organic Meats. Content of my reviews is never dictated by whether I bought a product or it was provided. I only work with brands I love and can recommend. All opinions shared are my own. It's Brussels Sprouts Season, and this recipe could change your mind about Brussels sprouts! They are traditional on festive autumn and winter tables, even though so many people don't like them. Even if you think you don't like Brussels sprouts, try this recipe. When I told my husband I was making Brussels sprouts for dinner, he began groaning and begging me not to. I told him to trust me. When dinner time rolled around, that man was loving the sprouts; he even had seconds! Raw Brussels sprouts are completely different from cooked. So if you've tried boiled, steamed, stir fried and roasted to no avail, try uncooked. Slice them very thin. If you don't have a food processor, use your sharpest knife. They're easier to slice if you cut them in half, lengthwise through the stem end, so as to have a flat surface. If you are vegetarian or just don't eat bacon, maybe throw in a handful of toasted nuts instead. You might need to add another splash of olive oil and wine vinegar just before serving, if the sprouts have absorbed all the dressing. 1 In small skillet, cook diced bacon until very crisp; remove bacon with slotted spoon. Pour clear bacon drippings into small bowl, leaving the little brown specks in the skillet. Wipe out the skillet, return 1 tablespoon of the drippings to the skillet and cook the minced shallot until soft; remove from heat. Whisk in vinegar, mustard, sugar, salt and pepper. Slowly whisk in the olive oil. 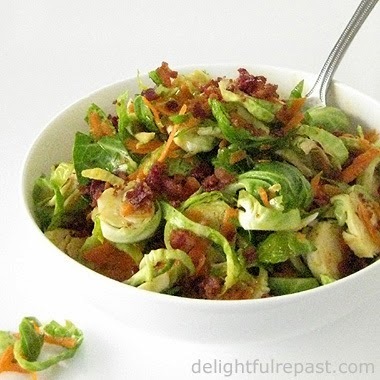 2 In 3-quart bowl, combine Brussels sprouts, carrots and bacon. Pour dressing over the salad and toss well. Taste and adjust seasoning, also adding more vinegar and oil if you think it needs it. Cover and refrigerate for 1 to 2 hours. PS: Special traditional meals also need Perfect Mashed Potatoes! Aaaahh ... Afternoon tea on a sunny terrace overlooking the Pacific. What a treat! While in southern California recently, a friend ran me up the coast to Santa Barbara where the scenic drive led us to El Encanto on a hilltop overlooking the ocean. 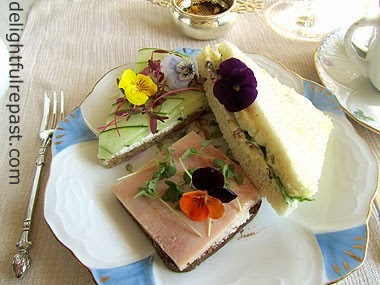 Afternoon tea is served seven days a week either in The Lounge or on The Terrace. Growing up with tea as I did and being a frequent giver, as well as attender, of afternoon teas, I have some pretty high standards. 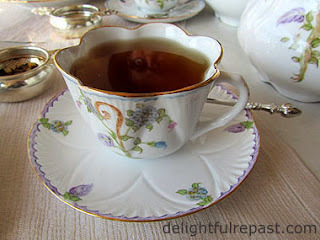 Having had tea from coast to coast and in three countries, I want a certain ambience, elegance, proper service, delicious and pretty food, and properly prepared tea. Most venues get a few things right, but few can deliver on all counts. El Encanto is one of the few. Of course, expansive ocean views along with the hotel's "casual elegance" vibe and beautiful hand-painted tea china mean they've got the ambience part down. All the staff I encountered on the property were friendly, efficient and enthusiastic. Our server brought out a wooden case of sample tins of the various loose teas so our noses could help us with our tea choices. With executive chef Patrice Martineau bringing his experience on three continents, including two years at The Savoy in London, the food did not disappoint. Unlike so many, he knows the difference between the more formal and lighter afternoon tea and high tea, so there are no inappropriate departures (such as soup or salad) from the traditional afternoon tea menu. The sandwiches, adorned with edible flowers, were as delightful to eat as they were to look at. I had been rather alarmed when I saw that the tea included just three sandwiches, but these sandwiches were more substantial than usual. I'm not a fan of smoked salmon, so the chef made a lovely ham sandwich in its stead. The open-faced cucumber sandwich was a thing of beauty. And the savory egg salad with snipped chives and French cornichons was outstanding. The scones, served with clotted cream and house-made jam, were excellent. 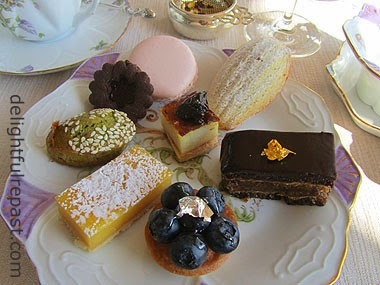 Though I don't usually eat the pastries at afternoon tea, I couldn't resist trying just a few bites from the jewel-box assortment of diminutive desserts. Superb! Oh, nearly forgot to mention the perfect, not overly sweet Bellini, a nod to Orient-Express, I presume. For reservations, call El Encanto at 805-845-5800. El Encanto is 97 miles from Los Angeles International Airport (LAX) and 90 miles from Burbank Bob Hope Airport (BUR). For tea at home, see: How to Make a Proper Cup of Tea and Tea and Scones. 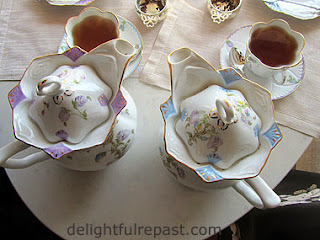 Look under Teatime on my Recipes index page for other teatime recipes. 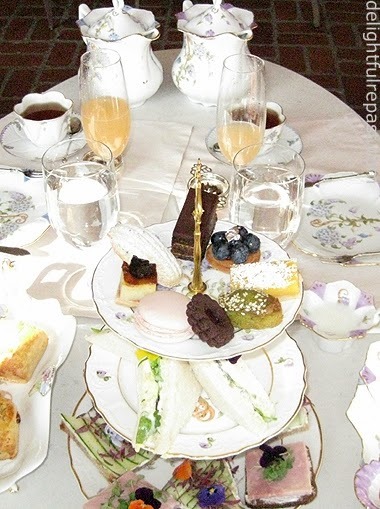 Disclosure: Though I attended the afternoon tea as a guest of El Encanto, I assure you that does not alter my opinions or influence my review. 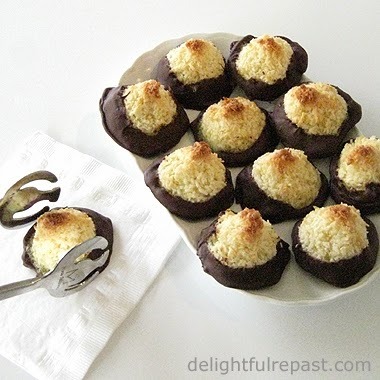 I've always made coconut macaroons, which use only the egg whites, so I was intrigued by this classic Swedish flourless cookie that uses whole eggs. Flourless, it is a naturally gluten-free cookie. I first learned of kokoskakor at one of my favorite food blogs, Five Euro Food. Of course, as is my wont, I made a couple of minor changes before even trying the original! Though I added a pinch of salt and a dash of vanilla, you might want to leave them out in the interests of being "authentic." Charles, the fine cook behind Five Euro Food, is British by birth, married to a Swedish woman, currently living in France and in the process of moving to Sweden as we speak. So, henceforth, I shall defer to Charles on all things Swedish since that's definitely out of my bailiwick! Think I'll make these instead of macaroons from now on. No more having a little dish of egg yolks in the fridge nagging me to make something out of them soon so they won't go to waste! Tell me (in the comments), what is the classic cookie of your culture? One of mine is Hazelnut Shortbread, which is also good half-dipped in chocolate. Note: See below for chocolate-dipped* option. 1 Line baking sheet with parchment paper. (Love my heavy-duty half-sheet pan!) Preheat oven to 350 degrees. In 2-quart glass bowl (I use a 2-quart glass measure) in microwave, melt the butter. With a fork, stir in the coconut until all is moistened with the butter. 2 In 1-quart bowl, whisk together eggs, sugar, vanilla and salt. Stir into coconut until well combined. 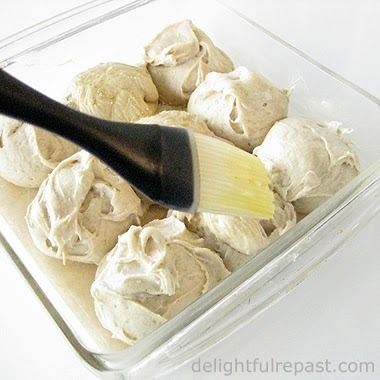 3 Using a #60 (1/2 ounce / 1 tablespoon) scoop, drop scoops of dough about 2 inches apart onto prepared baking sheet. With your fingers, form them into a rough cone shape, pinching them to a little point on top. Bake at 350 degrees for about 12 to 15 minutes, or until golden. * Chocolate-Dipping Option: In heatproof glass bowl set over simmering water, melt 1/2 cup semisweet chocolate chips with 1/4 teaspoon neutral oil, stirring occasionally. Dip bottoms of cooled cookies, place on waxed paper and chill for about 45 minutes. 4 Store cookies in single layer in airtight container at room temperature for up to 3 days.